I think one of the reasons many artists don’t do a lot of location sketching is because they aren’t prepared to. That is to say they don’t have pen and paper with them so when a sketching opportunity arises they can take advantage of it. My vest or shirt pocket almost always carries a small black Moleskine and a couple of pens in it. If my shirt or coat doesn’t have the right size pockets to accommodate a small sketchbook I don’t wear them! I don’t feel the need to draw everything I see but I know that if I have paper and pen I’m far more likely to practice! I no longer worry if I can draw something or not, I just do it and if it doesn’t turn out – so what? It’s all about practice and keeping your hand moving. Regardless whether you’re a portrait artist, an architectural artist or landscape painter don’t restrict yourself to just drawing within your specialty. 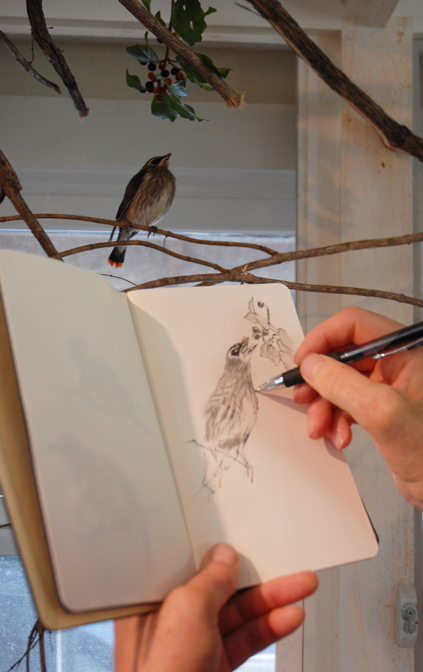 I’m a professional wildlife artist, which means I draw and paint pictures of nature, but, I don’t feel I have to see a bird or find a flower before I can sketch! That wasn’t always the case. I use to put only nature stuff in my field journals and sketchbooks. Now I draw or write what ever inspires me, and as a result, I actually sketch more and draw better. Here are some different ways that keep me sketching even when I’m not working in the field. I see two basic ways to keep in practice. Private sketching is drawing at a place where you don’t have to worry about strangers watching you as you draw. You can practice with less stress which means you can concentrate and do a better job of interpreting your subject. 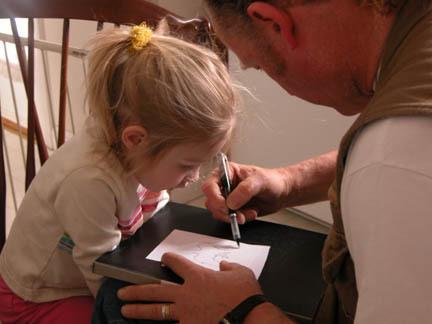 Sketching people around you, such as a spouse, room-mate or your kids is always good practice. Don’t overlook the TV as a source for study. The two characters on the left are from a local weather channel. It is a challenge to sketch from TV, as the camera jumps from person to person and sometimes you end up with a composite image. That’s OK because your goal is to practice, not create a likeness. The little French girl in my sketch is not French at all, she is my daughter Liz. I actually drew this image from a photo, but included it as a reminder that kids are great subjects. When sketching family I usually do simple contour drawings like the one of my son Chris with his first beard! If you don’t have kids, then sketch a spouse or a room-mate. You don’t get off the hook that easy! There are always pets, yours or your neighbors, or just look for things around the house that can keep your pen to the paper. Now let’s assume you don’t live with some kind of family, there are no pets, no TV and nothing lying around the house. Well then just Doodle for practice. I sometimes like to “phone doodle”. I made these doodles years ago during long, long distance calls to my future wife (each sketch was one call). I know, judging from the detailed nature of the works one might wonder just how much I was paying attention to what she was saying. I guess you’ll never know, I just liked hearing her voice! Now public sketching is where it gets a little tricky. If you’re anything like me (and you should hope not) you will need a way to soften the public humiliation that comes with sketching or painting in public. I will talk more about this in later posts but for now I have a couple of tips. Start by drawing with other artists or in front of people who are “safe”. Who is safe? How about your Great-grandmother that sleeps all day and walks the halls all night – I think she is safe. A safe person is anybody who will not criticize your efforts or make tongue-in-cheek remarks about keeping your day job! You are looking for someone like my Mother, may she rest in peace, no matter how bad I drew she was always amazed at my unharnessed potential for greatness – what a Mom! I think one of the safest audiences found are kids. Like my niece, Elizabeth. I used to drawn simple bird sketches for her and then give her the pen and let her draw one for me. We both loved it and we grew in confidence as we encouraged each other with exclaims of wonder. Try sketching at your kid’s preschool class or contact a local school and tell the art teacher (if there is one) that you would like to share some drawing skills with the students. This may seem stressful at first but you will be working in a supportive environment. Most art teachers I know welcome guest artists and always find ways to fit demonstrations into their curriculum . I always ask if the school has a budget that supports guest instructors – they usually find a way to pay me a few bucks! My next advise is to go to church! Church is always a safe place, no one dares to say anything while your sketching. If you stay for “coffee hour” people may ask you about it, and if you wish to share the sketch they are always polite with their comments…after all they’re in church! I don’t go out looking for public places to draw, but there are certain places I like to sketch at and church is one of them. Sometimes I take a 9 x 12 sketchbook to church but mostly I just draw in a small Moleskine book. If I forget my sketchbook I draw on the back of a bulletin (I never draw in the hymnals). 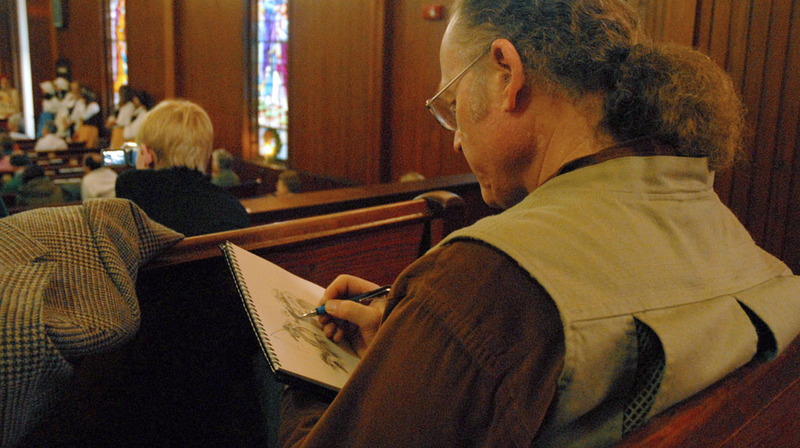 I’ll sit in the pew and sketch during the sermon – don’t worry, the minister will just think you’re taking notes on his wonderful sermon. BLOG WARNING: If you are sitting with your spouse , or significant other, you must not let them think your art is more important than being with them. I suggest only one small sketch per sermon! My sketches will range from simple line drawings to more shaded renderings. I treat church drawings as simply exercises in seeing shapes, negative spaces and as practice in creating controlled compositions out of chaos. It is not how good they are that matters, it’s that I’m exercising my creative muscle that counts! If you don’t have paper use a napkin! Another fun place to practice your eye-hand coordination is at a cafe or restaurant. If you forget your sketchbook you can always make the ever popular “napkin drawing”. In a cafe setting I do more or less blind contour drawings (drawing without looking much at your paper). 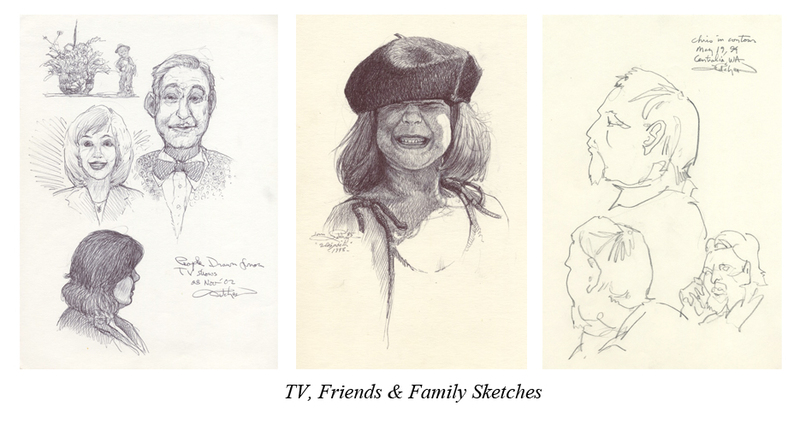 they’re simple, quick and you can do it without the people knowing you are sketching them. Here again, likeness is not the goal. You may not realize all the interesting faces around you until you start making contours of them. Have fun! This entry was posted in NATURIZING - my "How-To System" for sharing my passion for nature, art and journaling. and tagged building confidence, how to draw, ink drawing, John C. Pitcher art, life drawing, life sketching, sketching. Bookmark the permalink. ← WHITE OUT – Page Fright! NATURIZING – my "How-To System" for sharing my passion for nature, art and journaling.